Karen called me on 22 October 2010 to talk about the rattlesnake she found outside a screened window the previous evening, after dark. I just left you a voice-mail. The snake is now bagged and in the freezer. It appears to be a diamondback rattlesnake. If you still want the remains, let me know. A narrative of her actual snake encounter, which Karen kindly supplied after this article was written, is provided at the bottom of this web page. My reply to her was that I did want the remains to study. Of particular interest was whether the snake had recently swallowed prey; if so, the identity of the prey might indicate why this snake was in Karen’s yard. An on-going analysis I’m conducting of the physiological structure of viper pits and fangs would also benefit. Most snake specimens I study are without intact heads, while this one’s head appeared to be undamaged. That made it even more useful. The larger photo shown at left is an enlargement of the lateral head of Karen’s rattlesnake. The thumbnail to its right is a closeup of the lateral portion of the anterior head. Click on each photo to view an enlarged version. 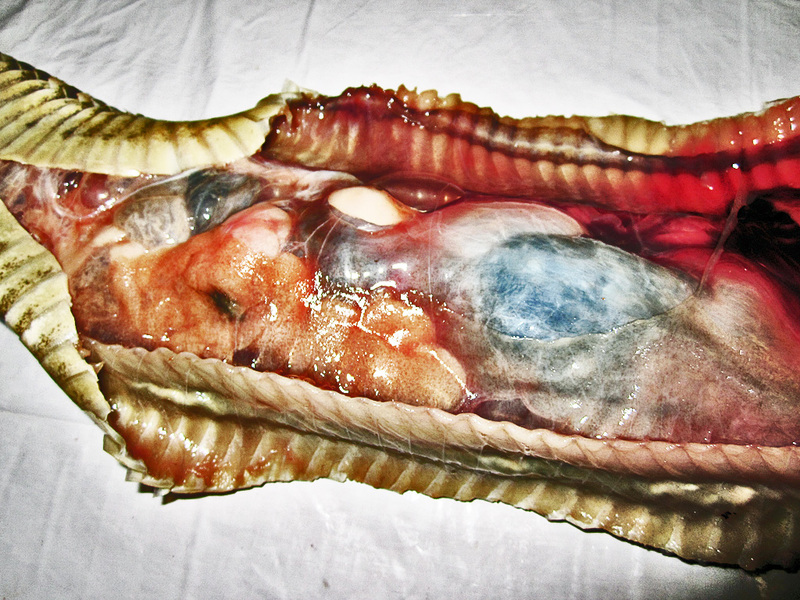 These photos were taken at the beginning of a postmortem dissection. Note the facial heat-sensing pits, forward of and below the level of the eyes (the nostrils, by comparison, are at the same level as the eyes, and slightly forward of the pits). 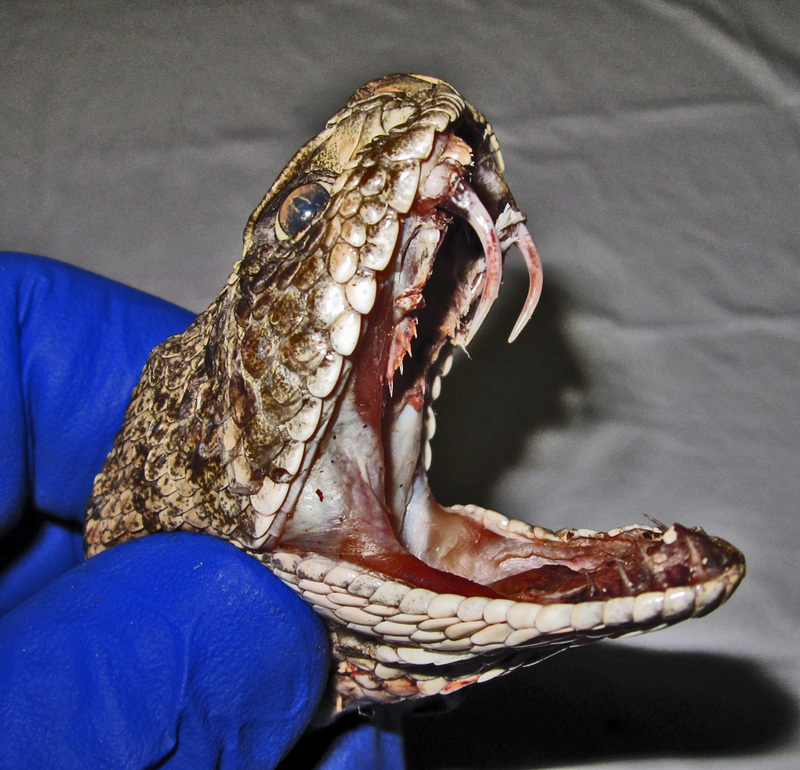 In April 2010, Elena O. Gracheva and her colleagues at the Department of Physiology, University of California, San Francisco, published their findings on the molecular basis of infrared detection by pit vipers. They discovered that a specialized tissue within the heat-sensing pits serves as an infrared antenna. Signals from this tissue are conveyed from the pit organ to the optic processing center of the brain, where they converge with input from other sensory media to enable the snake to”see” the temperature variations in its environment. The western diamond-backed rattlesnake is unmatched in its ability to detect, and perceive, infrared radiation in this manner. 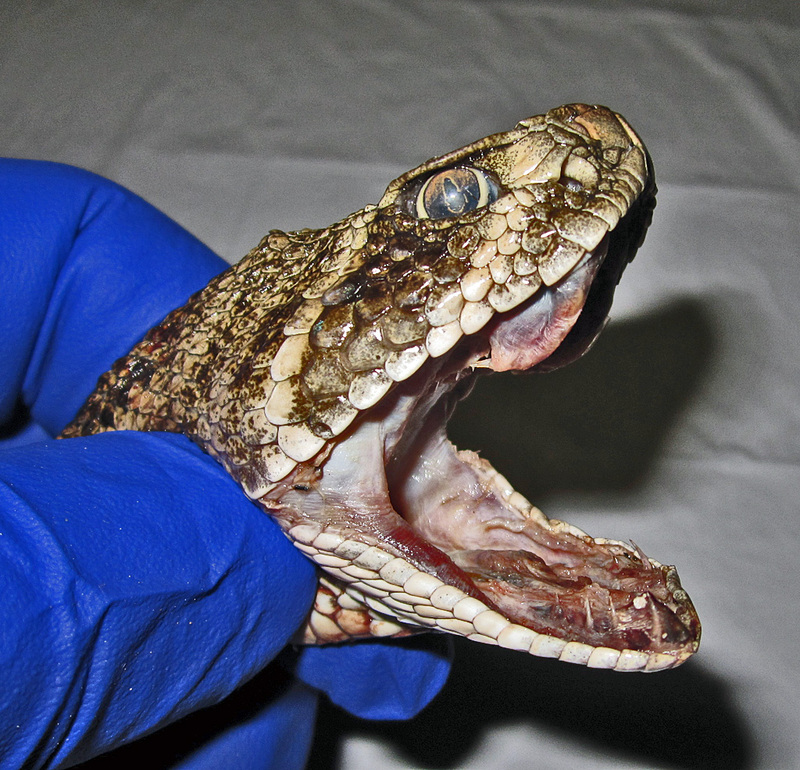 Interestingly enough, the membrane lining the rattlesnake’s pit is comprised of the same kind of cells that, in mammals, sense chemical irritants and inflammatory agents. We know them as wasabi sensors — the ones that give us that sharply delightful, but thankfully transitory, pain in our sinuses when we taste fresh horseradish. That sensation is mildly addictive, which explains why we love to indulge in tasting small amounts of wasabi at our favorite sushi restaurants. As in the physiology of the pit viper, our wasabi sensors are integrated into our nervous systems at a high level. In fact, their activation produces such priority interrupts in the brain that Makoto Imai, at Shiga University, Japan, has developed a device that emits wasabi vapors to serve as a fire alarm for the deaf. Tests have confirmed that only a few seconds are needed, after the wasabi vapors are emitted, before the sleeping occupants in the room are aroused. The fangs of Karen’s rattlesnake are shown in their normally sheathed, retracted positions. Notice the relatively long, robust, backward curving teeth on the anterior lower jaw, as well as mid-jaw on the upper jaw, just posterior of the fangs. These latter teeth appear, in the enlarged photo (click on the photo to enlarge it on your screen), as detritus on the fang tip, but on closer examination are clearly small teeth jutting out from the upper jaw. They have a role in keeping prey immobilized while being swallowed, holding it in place as throat musculature grips and moves the prey deeper into the gullet. In subsequent photos (including the smaller thumbnail photo directly to the right of the larger photo above) you will see the fangs extended with their sheaths removed, along with a micrograph of a fang tip, showing the venom discharge orifice. In the thumbnail, above, you can see the eye and pit of this specimen up close by clicking on the thumbnail. 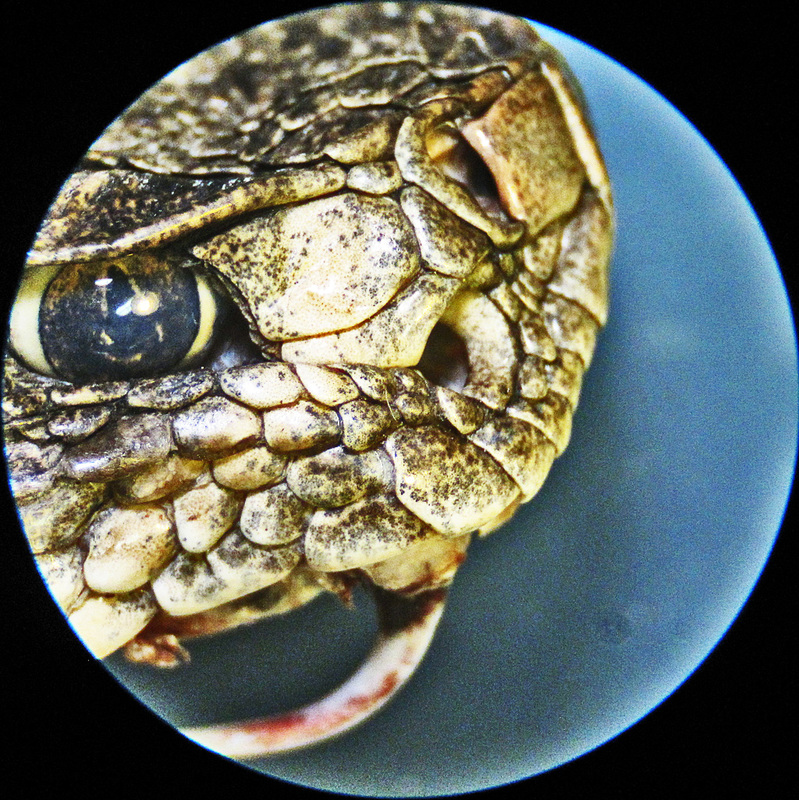 The pit, to the far right of the eye, articulates with a depression just to the right of the eye, and contains specialized heat-sensing tissues that enable pit vipers like the rattlesnakes to sense minute temperature differentials in the environment, a faculty that aids in finding prey in the dark. Karen and her husband, T.J., purchased their Cedar Creek home, and its surrounding acreage, several years ago. All the homes in this subdivision reside on several acres of land, and many who live here have horses, along with spacious horse barns and their associated structures. It seems safe to speculate that most, if not all, of those living in this quiet residential neighborhood came here to satisfy a hard-felt longing for wide-open spaces. Not just any wide-open spaces, either, but those where horses are welcomed, even deeply appreciated. Karen and T.J. plan to add a horse barn to the rear of their property sometime in the future. At the time this snake encounter occurred, their lot hosted a spacious residential home with an attached garage, surrounded on its immediate periphery by lush vegetation. An expanse of yard was in front, and in back, replete with closely cropped native and domesticated grasses, a stack of building materials on the driveway, a number of isolated stands of prickly-pear cactus, and — of course — the obligatory Texas wood-pile. The yard beyond the perimeter of the home — extending to the the fence that marked the border of the multi-acre lot — was the sort of shortgrass prairie a horse would love. Just what Karen and T.J. had in mind when they chose this setting. They also believed that the prairie would serve as a barrier against incursions by rodents and snakes, but as explained below, that belief suffers from several flaws. It is true that a mouse, rat, or snake would have to cross 50 to 150 yards of shortgrass prairie to reach the lush vegetation near the home. In the daytime that would be problematic, as these animals would be easy to see, both by humans with hoes and by raptor hawks with talons. But the sun rules only half the day, and rodents forage as much at night as in the day, while most snakes, including rattlesnakes, do most of their hunting and tracking of prey nocturnally. At night, rodents and snakes alike are easily capable of crossing this distance, under cover of darkness, unseen by humans or hawks. Owls, though still a threat at night, do most of their hunting in forested areas where trees offer them a vantage point from which to survey the forest floor for signs of scurrying mice and rats. A mouse or rat crossing a shortgrass prairie, at night, is pretty safe. Once within the confines of a residential home’s lush landscaping — provided the vegetation is thick enough to prevent humans, dogs, and cats from visualizing the surface of the ground — snakes and rodents alike would generally be protected from visual detection, both day and night.Wood piles, stacks of lumber or other materials, offer additional safety features. Though domesticated dogs and cats are potentially capable of offering some protection from incursions of rodents and snakes, they cannot be relied on for that purpose. Ironically, having domestic dogs and cats at a home may contribute to the problem in two ways: their food dishes provide rodents a ready source of excellent food, and their feces provide another — though perhaps not quite so excellent — food source. Beyond that, many cats are poor mousers, and most canine breeds were not bred to hunt rodents or kill snakes. Thus they have little or no innate skills for dealing with snakes. Exceptions are the terriers and similar breeds, which are often quite good at both jobs, but such animals pose a huge set of unusual challenges that most of us are unable to handle. Suffice it to say that I’ve observed a number of yards that were seriously infested with rodents and snakes, despite the presence of domesticated dogs and cats. On the other hand, when a cat or dog meets a venomous snake, a snake bite often ensues that either wounds or kills them, and — either way — post-bite vet bills tend to be staggering . Consider the above words, then absorb two more facts: (1) once rodents reach the lush landscaping of a residential home, they tendto stay as long as they find food and are sheltered within a habitat containing a modicum of visually impervious cover, even if the house is “protected” by a dog or cat, and even if the home has no woodpiles or similarly fortified habitat; and (2) when rodents take up housekeeping in a home’s landscape, their presence attracts other rodents to the same site. It is not generally possible to keep rodents from coming around. They will do so, no matter what. The trick is to keep them from staying. Rodents that are hungry tend to forage randomly, zig-zagging their way across a field until they find something to eat; if habitat is present, they may nest and breed there as well, remaining day and night most of the time, but regularly traveling afield, to and from the surrounding woodland and meadows. Their wanderings afield are no longer random, however, but follow a limited number of tiny, established, beaten trails. These trails, while typically invisible to the human eye, are coated with small amounts of rodent body oils, strewn with rodent feces, and stained with rodent urine. Such contaminants produce a fragrant cacophony to other rodents who cross the path by accident, telling them that other rodents are traveling that pathway, and suggesting that, at one end or the other, they will likely find a source of food. Thus, once one rodent finds a food source, other rodents will soon be drawn to the same source. And, where there are rodents, snakes are not far behind. The symphony of rodent smells found on their trails beckons every species of snake that favors rodents for food. Karen tells us, in the narrative quoted at the end of this article, that she has regularly seen rat snakes in her yard. Wisely, she took pains not to kill them. Today she knows that they could have served as an early warning that her landscaping was hosting rodents in large numbers for a reason. It is neither normal nor healthy to have lots of rodents around the outside of a home, even if they are not getting inside (which they ultimately will). Now she also knows the importance of such warnings: the snakes rodents attract aren’t rat snakes alone. Most snakes, including rattlesnakes and copperheads, are highly attracted to rodents, so anywhere rodents are feeding is also a place where snakes — venomous and non-venomous alike — should be expected too. They get there via their sense of smell, but the sense of “smell” possessed by a snake isn’t exactly the same as that of mammals. They use a set of specialized Jacobson’s organs, in the roofs of their mouths, to detect the scents picked up by their flicking tongues. Each outward flick of the snake’s tongue picks up a few molecules of aromatic matter from the air, and each withdrawal of the tongue, inward, brings those molecules into the oral cavity. There the tongue pauses for a few milliseconds to deposit the captured molecules in the Jacobson’s receptacles in the roof of the snake’s upper jaw, whereupon it is flicked outward once more to pick up additional volatile matter from the air. A few flicks, and the snake has a pretty good picture of what has recently passed over that ground. If a rodent is involved, the snake will begin to follow its trail, using a few basic rules to keep it on the path. If the snake wanders too far right or left, for example, the scent diminishes. When this happens, the snake pauses, tests the scent on either side, and then changes direction in favor of the stronger scent. This brings the snake back to the path. Ultimately it reaches the place where the rodents are feeding, nesting, and breeding. Notice the photo at far left, taken after the soft tissue sheaths over each fang have been removed with a scalpel. The thumbnail to its right shows the unsheathed fang next to a measuring bar with 1/8th inch (3.2 mm) graduations. From that image we can safely conclude the fangs of this specimen would be able to penetrate to about 5/8th inch (16 mm) or more into the flesh of its prey or that of a perceived threat. 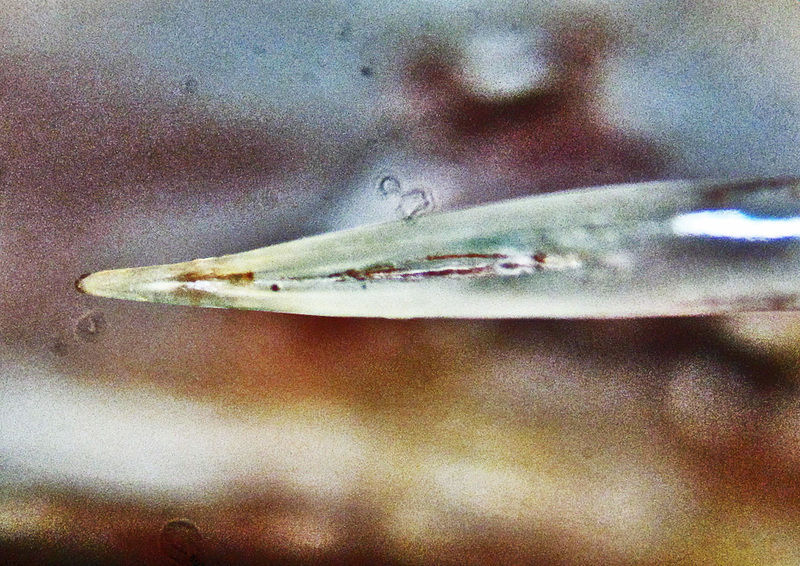 Deeper penetration–up to double the actual length of the fangs–can occur when soft tissue is momentarily compressed during the bite event. The deeper the penetration, the more lethal the bite, since the tissue damage will extend to musculature and other tissues positioned beyond the dermal and fatty tissues near the surface of the body. Snake bite dynamics lead those who know to wear leather boots, preferably western boots with elevated heels. 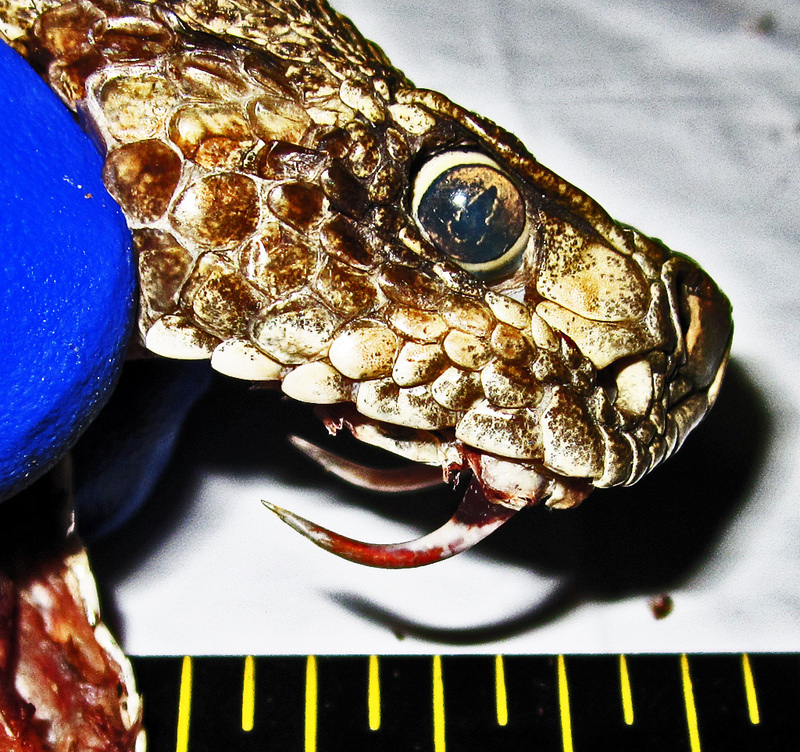 Most snake bites occur within 12 inches of the ground, on the foot, ankle, or lower leg. It’s even better if those boots are covered by thick denim or another form of heavy, woven cloth that extends down to the ankle or below. Elevated heels on western boots raise the thickest part of the boot upward, and allow trousers to slip to the heel without dragging in the dirt. Most regular boot junkies wear jeans that are 1-2 inches longer than normal, so the denim doesn’t hike up the boot when the wearer is seated. That extra denim does an even better job of occluding the snake’s venom discharge ports, and of soaking up whatever venom is ejected, further reducing the risk of a wet bite. Though Karen’s snake measured about 42 inches in length (tip of rattle to snout, using a best-guess estimate of rattle length, as it had been removed), a juvenile only 40% its length (17 inches,) that was killed in San Antonio in April, had fangs measuring almost exactly half the length of those possessed by this larger snake. The area around Cedar Creek beckons all who have any appreciation for its beauty and the diversity of botanical and animal life found there. This is one of the nicest parts of Texas, and its rich history is an important part of Texas lore. It was settled by European immigrants as early as 1832, when Addison Litton was granted a league of blackland prairie on both sides of the creek for which the area is named. Addison and his wife, Mary Owen Litton, were soon joined by others, including Jesse Billingsley and John Day Morgan, and log cabins sprang up to house the pioneers. When, in January 1842, a Methodist minister preached at the Owens home on Cedar Creek, a full house heard his homily. The Cedar Creek community revolved, for some years afterward, around Methodist gatherings. Answering Karen’s question directly required actually walking around her yard, boots on the ground, so to speak. It didn’t take much encouragement to accept her challenge and drive out to her part of Bastrop County again. Notice the image at left. This is a micrograph of the leading tip of one of the fangs of Karen’s rattlesnake. The tip is solid and pointed, so the fang can quickly pierce skin and flesh, penetrating to the full length of the fang shaft if no obstruction or impediment is encountered. Further up the fang towards the mouth, the tip of the fang is creased along its leading edge. This crease is actually the vestige of a folding of what was, in much earlier times, a grooved tooth that provided an open channel within which venom flowed. Over time the grooved tooth developed into a hollow tooth, which formed out of the hard tissue on each side of the groove, as it grew more robust and curved inward. Because snakes with deeply grooved fangs were more successful than those with shallower grooves, the genes for deep grooves were passed on more often, until only deep grooves could be found in the species, but the selective pressures continued, and deeper and deeper grooves were favored until, eventually, they folded around the venom channel completely. 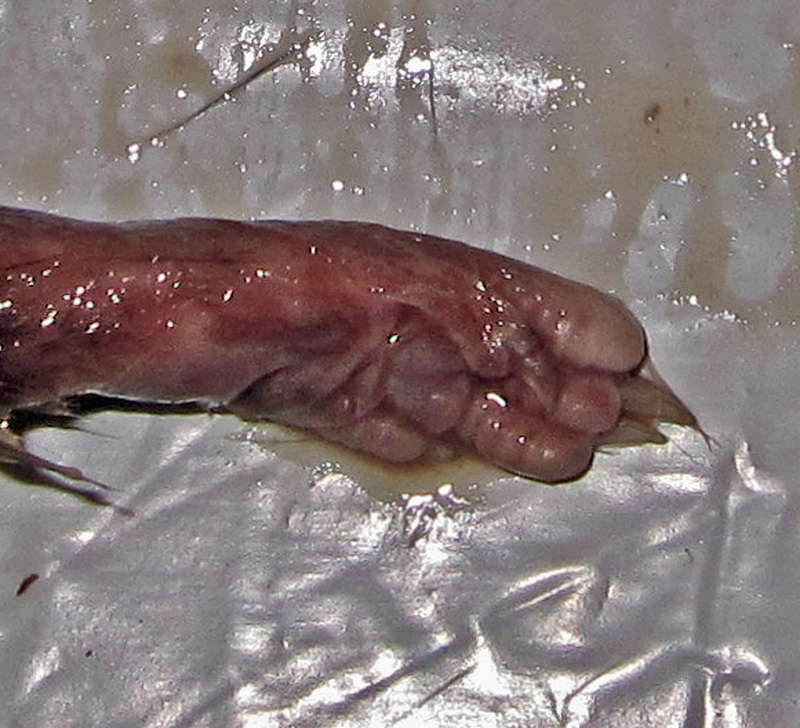 Today, the viper’s fang is closed along its shaft, except distally, where the discharge orifice shown in the photo remains. It is clear, from this photo, that the orifice through which the venom is ejected is positioned rather near the tip. This may seem to be in variance with what Lawrence Klauber noted in his book, Rattlesnakes: Their Habits, Life Histories, & Influence on Mankind, and with an earlier postmortem I performed on the juvenile snake of this same species, mentioned earlier, that was killed in San Antonio on 1 April 2010. In that earlier postmortem, it was observed that, as Klauber pointed out, the venom discharge orifice is not at the tip of the fang, but quite above it, and thus would easily be blocked by heavy leather or cloth, should the snake strike a person wearing boots overlain with clothing. Now, in the case of Karen’s specimen, the discharge orifice is almost at the tip of the fang. But it still isn’t at the exact tip, as is the case with the coral snake. And, because it isn’t at the exact tip, it is still easily occluded by a leather boot or clothing. The fact that it is on the leading edge of the tip, i.e., the surface projecting outward from the snake’s body, rather than laterally, or on the inside surface of the fang, is important, too. A lateral orifice (as found on the fangs of many spiders and on the stinging apparatus of bark scorpions) is not quite as efficient as one on a leading edge, and an orifice on the inside surface of the fang would be seriously occluded during the bite sequence from the compressed flesh of the bitten subject. An orifice on the leading edge of the fang, however, would be most free of occlusion at the point when the snake is biting most forcefully. The lesson is this: if you are walking around outside, in snake country, you take a greater degree of risk if you choose to go bare-footed, or bare-legged. The risk goes down when you wear high-topped leather boots, with relatively heavy denim pants that drop to below the ankle, so wear your jeans outside the boot, not inside them. Any protection you can muster, from leather boots and cloth trousers, diminishes the depth of penetration. Many are surprised to learn that most ordinary high-topped work boots will prevent penetration of the boot, of even a large rattlesnake fang, to the skin altogether, and that denim or other heavy cloth works to soak up venom before it can enter a bite wound. Avoiding a snake bite is a pretty good idea. If you get bitten by a venomous snake, and it’s a “wet bite” (venom is injected into your flesh), prepare to spend (or whack your health-insurance policy) to a tune upwards of $10,000 to $100,000 (some say, more recently, a range of $50,000 to $150.0000, particularly if plastic surgery is required) in medical bills, and to be laid up for one to several weeks at the least. If you are unlucky, you may lose part or all of the affected limb, or part or all of the functionality of that limb, and yes, fatalities are not out of the question. “Wet snake bites” are not trivial issues. It is not uncommon for those who invite me out — to investigate the recent discovery of a venomous snake — to accompany me on a walk-around of their yards wearing sandals or flip-flops, bare-legged… Though in awe of their native bravado, I display my lack of it by wearing 16-inch leather boots, with denim trousers that cover the upper boot down to the ankle. Yes, it’s true–I’m gutless. But it’s not so much a fear of snakes as a deep respect for the consequences of a venomous snake bite that drives these habits. Back to Karen’s rattlesnake and the mystery surrounding its presence in her yard. In all honesty, I’d figured rather early on that the mystery here would not be very complicated. That’s not braggadocio. Snakes almost always show up in places where they should be expected, and they tend to shy away from places where they should not be expected. The question is, what about a particular place makes it one or the other? The answer was provided earlier: snakes are propelled wherever they go by very specific vectors. It is rare for a rattlesnake to be found in a place bereft of appropriate habitat and prey. When–in areas known to host native rattlesnakes–both habitat and prey are abundant, anyone with even a modicum of understanding of snake biology (such as you, once you’ve read this article carefully) would be foolish not to expect to see all three, together. The photo at left is of the belly of Karen’s snake, after it was cut open to reveal the stomach. That’s the bluish mass in the right-center of the photo. In truth, a snake’s stomach is a relatively lengthy structure, so the bluish mass is not “the stomach” as much as just “part of” the stomach, but you get the point. The bluish-colored mass in the photo is where the majority of the most recently swallowed food happens to reside in this particular snake. That mass was extracted after making an incision in the stomach wall, and is discussed more completely below. First, though, let’s lay the groundwork for that discussion. The process of avoiding rattlesnakes is a rather simple to articulate. Some time ago I put together a special article on avoiding snakes altogether, and another on the effectiveness of snake repellents. But because it was clear that neither contained the last word on either subject, another paper was composed on the definition of a reasonably snake-free environment. Easy to articulate, hard to effectuate. That’s the essential nature of the topics we are discussing here. And this happened to be one of those times. If you read the articles linked to above, you will notice that, for homes troubled with snakes, a large part of the equation is the abundant presence of prey favored by the snake that is being observed. Mammals in the order Rodentia have two constantly growing incisors in the upper and lower jaws that are specialized for gnawing). 40% of all mammals are, from a taxonomical perspective, rodents, and, from a demographic perspective, they are found in huge numbers on almost all continents. Not only are rodents preyed on by snakes, but so are a number of “rodent-like” animals such as weasels, rabbits, shrews, voles, mink, ferrets, and pikas. Even larger mammals, such as opossums and raccoons, provide snakes excellent food in their litters; it is not unusual for these animals to suffer raids from snakes that steal their babies while the adults are off foraging for food. Snakes are not that particular about where their food hails from, but they are very appreciative when their food sources give them some clue to their presence, in the form of scent trails along the pathways they traverse to and from their foraging and nesting habitats. And, in the case of every one of these animals, rather copious scent trails are laid down whenever they travel about. When the mass in this snake’s stomach was extracted and examined, it turned out to be a long-tailed animal with a relatively long, scaly, hairless tail. Does that sound like the description of a rat? It does. However, the rear foot of this animal has anatomical features reminiscent of an opossum. An article I wrote earlier in 2010 describes the opossum’s rear foot, and also shows the scaly, hairless tail of that animal. Young opossums are a favorite food of snakes, as are young raccoons and similar animals. The anterior half of this animal has already been partially digested, but I plan to examine it later in greater detail and hope to eventually arrive at a firm conclusion regarding its identity. Cactus that grows in stands like prickly pears, and other thorny and/or brambly botanicals such as roses (especially wild, or antique, roses), bougainvillea, raspberry and blackberry bushes (all members of the rose family), and pyracantha (also in the rose family), provide unusually good habitat for rodents because they discourage predation, within the confines of their botanical structures, by large animals that prey on the animals sheltered there. A woodpile, and a stack of lumber and other building materials, provided fortified habitat for both rodents and snakes. Most of us have such things in our yards, and we tend to think of them primarily as eyesores when, from an ecological perspective, they are more complicated. For one thing, woodpiles are excellent termite incubators (another story, but its a bad idea to have termites incubating in your yard). More germane to this article, fortified habitat for snakes and rodents tends to make a home’s rodent and snake problems intractable. Regularly lacing them with rodent bait helps, but such bait loses its functionality when it gets wet, and the wrong kind of bait can pose a hazard to domestic pets and other, non-target animals. As mentioned elsewhere, environmental conditions that require one to apply quantities of rodent bait on a regular basis should be avoided. The best solution to all the risks a woodpile poses is to convert it to an organized rack of fire wood. That’s not as easy as it sounds. I’m preparing an article on that subject to be published in the not-too-distant future. In general, anything that provides ground cover such that it prevents one from visualizing the floor of the ground around one’s home is contrary to the goal of eliminating rodent habitat. The presence of such botanicals around a home is practically a guarantees that the home involved will some day become a favorite habitat for rodents. And that means that home’s perimeter will subsequently become a good place for snakes to congregate. Of course, one can regularly bait such areas with rodenticides. We did that at this home, of course. But such a practice is–besides being messy and a continuous drain on one’s energies not to mention the cost of the bait–rather contrary to good environmental stewardship. 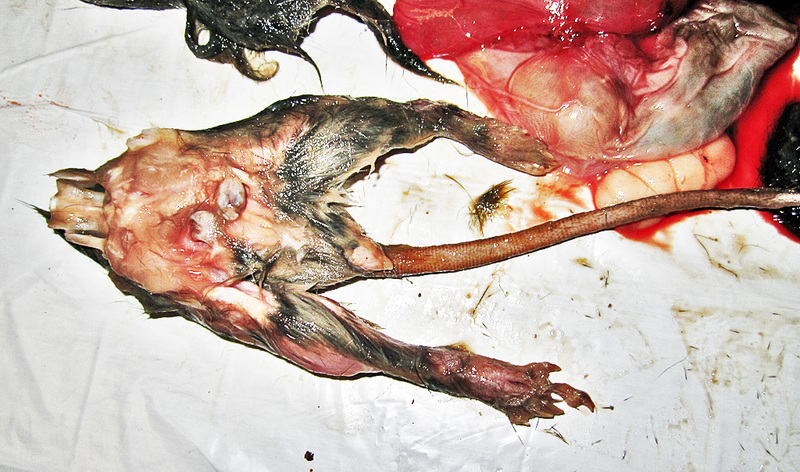 One’s choice of rodent bait matters, too, though this article is not the right place for an in-depth discussion on such matters (choosing one that kills rodents but is not likely to kill dogs or cats, is a topic I’ve researched in in depth for many years). Suffice it to say, limiting the need to bait for rodents, even to the point of never having to bait for them at all, is the best solution where it can be achieved. Unfortunately, most of the time that solution is not available, and in those situations a much more satisfying approach simply modifies the habitat on the home’s perimeter and in the yard, so that both cease to attract and nurture rodents. Once that is done (and, of course, kept up) rodents and their predators stop coming around. Karen and T.J. are mulling over the “bad news” about their yard. They know how important it is to not invite rodents and similar animals to take up residence near their home, but they also realize how much time, work, and–yes–money, it will take to make their home rodent unfriendly. Before taking temporary leave of this article, one more thing should be mentioned. Remember what Karen’s neighbors told her? “There aren’t many rattlesnakes around here.” Well, the fact is, this general part of Texas happens to be home to not one, but two species of rattlesnake. And both species are likely rather common here. They just aren’t very visible. 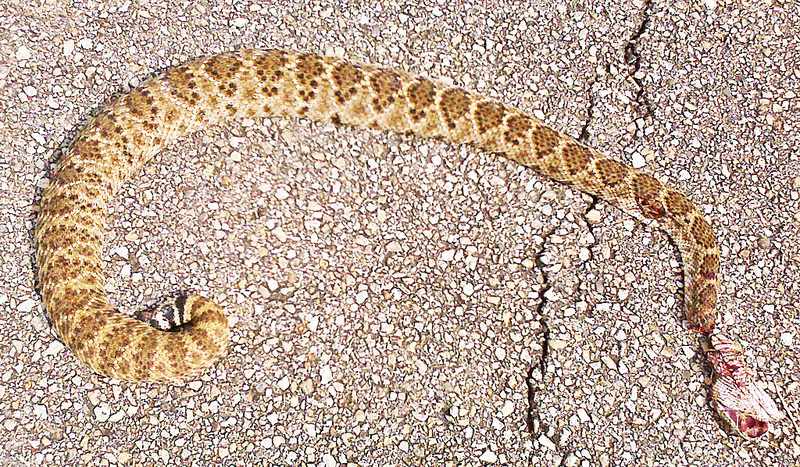 Most rattlesnakes stay out of our way, out of sight. My point is this: if you live in Texas, or just about anywhere in the southwestern or southeastern United States, and your yard provides a good place for rodents to live and breed, you can expect to see snakes, and some of these snakes may even turn out to be rattlesnakes. Keep that in mind. And, hey, wear your leather boots, and pull a sturdy pair of jeans over them–all the way down to your ankles–when you walk around outside, Y’heah? “I turned on the porch light and had a brief anxiety attack of my own. Was I supposed to just close the windows and forget I saw it? I certainly wasn’t going out there to try to do anything about it myself but I wasn’t sure I would ever let my son outside to play as long as I knew this thing was in the area. Coincidentally my neighbor called right then; her husband grew up on ranches in New Mexico and Texas… he would come over and take care of it. “A couple of comments from the information on the web page: we’ve seen plenty of rat snakes over the years, a few different varieties and many different sizes and stages. I even freed two of them over the summer from a piece of netting they had become hopelessly tangled in. Rather have a few rat snakes than a hundred mice. Also a couple of neighbors have reported rattlesnakes but they are not common. Less than one reported per year. “We are interested in working with your advice for plants to use in a habitat modification exercise, and we would be happy to have the results appear on one of your web sites. We are starting some of the de-construction tomorrow with the removal of the bougainvillea in the front and the landscape blocks in the back; the nut grass removal ‘project’ in front of the garage is a daunting effort that will probably have to be delayed for a few weeks. Please let us know how you want to proceed from here; we’d like to see a list of recommended plantings so we can plan to get some new things in over the winter. Karen manages to get her points across in unmistakable form. I’m looking forward to working with her and T.J. to make their home and yard less rodent (and snake) friendly. As we go through the planning and execution phases of that project, photos and text will be provided here.